Do you dream of living in a community that fits your lifestyle and provides a safe, family-friendly environment to raise children or retire? Have you considered a gated community? Gated communities, like Scissortail, provide so many benefits to the residents that live within them. If you want a sense of peace, security, privacy, and luxury here are 7 reasons to dream it, build, it and live it in Scissortail, Bentonville’s newest and most prestigious gated community. Scissortail is the perfect combination of privacy, security, and style. One of the many benefits of living at Scissortail is the safety and security of a gated community. Drive down quiet, low-traffic streets where your kids can play. Scissortail is the ideal place to raise a family or to enjoy the reward of retirement. Discover your luxury lifestyle at Scissortail. From beautiful landscaping, elegant homes, and deluxe amenities it will be like checking into a luxury hotel and never having to check out. Scissortail is the pinnacle of Northwest Arkansas living. Purchasing in a master-planned community is a smart investment. You won’t ever worry about waning house values in a Scissortail home. You can be sure that your property investment will retain or even increase in value. Some studies have shown that master-planned communities command at least a five to ten percent price premium over houses in subdivisions due to covenant controls, amenities, and luxury home design. Not all homes are made equal. That’s why Scissortail only uses eight exclusive builders chosen for their distinctive designs and a long history of the finest quality homebuilding. Scissortail’s custom-built houses are more like a work of art. Each one is designed and constructed with stunning architectural details, rich textures and materials, and artful design. A good school district can mean all the difference. In addition to your kids receiving the best education, it also means increases home values. Scissortail’s youngest residents attend Bentonville School District, one of the top-ranked school districts in Arkansas. Soon, our families will be able to walk to school at Evening Star Elementary, located across from Scissortail. Scissortail is more like a small town than a neighborhood, and that’s all intentional. We believe in building a close-knit community. The clubhouse has ample space for all types of events, from neighborhood potlucks and private parties to business meetings in our spacious conference room. Living in Scissortail means fun for the whole family close to home. Here, families have easy access to the private fitness center, sports court, and two resort-style pool areas. When you live in a master-planned community, amenities are available and well maintained for you to enjoy. Isn’t about time you started living your life to the fullest? 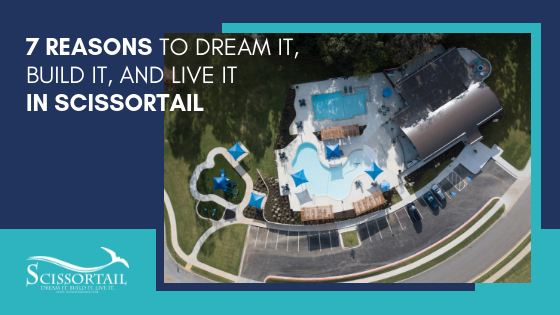 We gave you 7 reasons to love Scissortail, but we invite you to experience all that our little slice of heaven has to offer. It’s time to let go of what’s holding you back and come see us! Contact us today to start living the life you deserve.